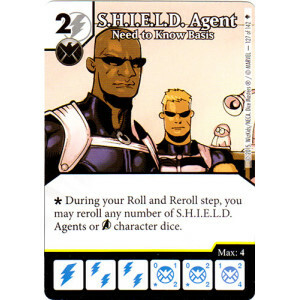 A Theme Team, at the ranks of SHIELD is a Spy,and he interferes with the plans of the Heroes. Also he plays right in the hands of this Small Legion of Doom Group that just wants a little piece of the Cake that Lex Luthor always is baking. For this purpose Mister Sinister and Gobby are invited too to this Birthday Party of Doom. Get an Agent and Black Manta, field them. Get Cheetahs for small damage and a Mister Sinister as Punch-Line. Also field a Gobby from Time to time and some SDKs. If your Mister Sinister doesnt Like the Prep Area, KO a SDK in the Turn, bring him back and buy something for 1 Energy Cheaper and also activate Black Mantas Retaliation. Solomon Grundy is our Removal and Blocker. Distraction could be changed for something else that uses Bolts as global or whatever you like. The Outsider is our Zatanna/Resurrection here. We love Villains, we want Villains, and if not hope it is a SDK. So what do you think? Will it be crushed or somehow succeed? Any reason for Essex over Nasty Boy? Because of KOing a SDK and him in the same turn and bringing him back to live again. Also if not possible hope for Firestorm and revive him the old way. Distraction is not so helpful for it so this BAC should changed.